A complimentary review copy was offered, in exchange for an honest review. Ever since Seed I have been fascinated and drawn to Ania Ahlborn’s work. Each and every book that I have read by her has played out like a movie. The imagery paints a gruesome, twisted story all in print while seeming to come to life before the reader’s eyes. This is the magic that Ahlborn controls. This is the masterpiece that is her raw talent as a writer. While I have not been one to read her writings in chronological order of new book after new book, she has never failed me in being impressed with her tales of horror. Brother is no exception to this rule. The cover is simple but lures the reader. A simple padlocked door. What could rest behind it? The story itself is that of the Morrow family. The family is one brought to be killers by a mother haunted by her own past. However, while Mama’s story would be enough to intrigue it is Michael that is our main character. Michael is not a Morrow by blood only by name. The reader’s discover that Michael was actually kidnapped as a present to replace the family dog. Yes, in this family a new brother seems the best replacement for the favorite pet. In this family the norm is to find the girls and women no one cares about and will not be missed and kill them. To some of them it is sport, to some a hunt, to the rest it is only what you have to do as part of the family. Michael is the good son that fits in without enjoying the kill. He provides for the family by hunting wildlife to keep the family fed, and after a fresh kill by the family he’s the one responsible to clean up the mess. It’s your typical family life. Right? Not so much. Still it is Michael’s life and he accepts it… that is until he goes on a visit to a record store with his brother Rebel. This is where the story takes it’s twists and turns and down spirals. This is where things go crazy… well more so then a family hunting forgotten girls. Once Alice comes into the story it all changes for Michael. It leaves Michael wishing for something more, something new. If only Michael knew that sometimes getting what you want is really not the best thing. It is up to our readers out there to decide if they want to find out what happens next. 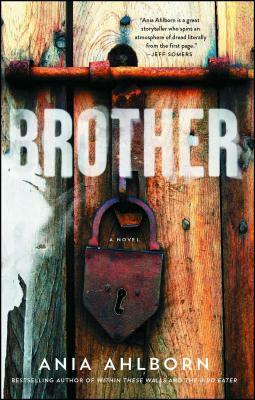 Pick up a copy of Brother and take a stroll down a darker path. Who knows where it may lead. For me this is just another Ahlborn book in my collection that did not fail to impress. The end in itself was the closure so unexpected and yet needed. For the readers out there, pick up the book and give it a try and after that back track or move forward and read Ahlborn’s past and current work. It’s a dark adventure but it’s a good one. Until next time, happy reading!